I think it's well known that runners are a unique group of people. We get up at dark-thirty or squeeze in a run during lunch breaks or after work, we hit the pavement in the rain, sleet, snow, heat and humidity. We often complain that the run was hard, but in the same breath start talking about it in terms of unicorns and rainbows. What drives runners? Where do they find that motivation to do something that's not always pleasant? Let's face it, running can hurt (hello chafing, blisters, black toenails, lungs on fire). Running can be mentally tough as well. We talk bad about ourselves, doubt ourselves. But somehow, we keep going. Why? How? For me, it's almost impossible to really explain why I keep at it. It makes me happy. It clears my mind. It makes me feel accomplished like nothing else. That isn't to say that I don't lose motivation from time to time. There are days when the thought of waking up early once more sends me into a 2-year-old tantrum state of mind. Thinking about having to layer up and face frigid temperatures or hit the road during the oppressive heat of summer makes me re-think my sanity. I think all runners go through phases where we lose motivation - it might be a day, it might be a month. 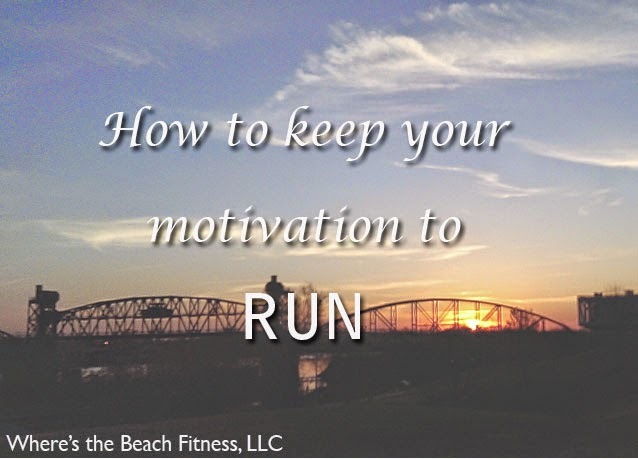 So, how can you stay motivated to run? Have a goal. Sometimes just having a goal, whether it's a race, a new distance, a faster pace, it can help keep you focussed. It can give you a reason to wake up while the rest of the city sleeps. Vary your routes. A change in your route also means a change in scenery and often a change in the miles. Vary your paces. Sometimes take it easy, sometimes test yourself. Get social. Running can be a very isolated sport. If you're really getting into a rut, lost all motivation, maybe it's time to get social. Find a friend, beg your spousal unit to join you, or find a local running group. Sometimes running with others even once a week can make a huge difference mentally. Be present. Stop planning your day away. It's impossible to not think during a run, but let your thoughts flow freely. Don't stress about time, don't think ahead to what's scheduled for the day. Be in the moment. Take a break. If you find yourself really struggling, listen to your body and take a rest day - from all activities - let your body recover. Relax. Sometimes we begin to tense up during our runs making our bodies less efficient and the run, well, just unnecessarily harder. Inhale, bring your shoulders up (probably higher than they already are) then exhale hard and let the shoulders and arms drop at the same time, shake it out. Recognize it's tough. Running isn't easy. It's going to be hard. That doesn't mean you can't enjoy it or that you're doing something wrong. Even when runners say they had a walking on air, glitter and sparkles run, it was still hard. Don't forget that part. It's hard, but worth it.